Warning: Spoilers ahead for tonight's episode of The Flash, titled "King Shark." If your head is spinning following the cliffhanger at the end of tonight's episode of The Flash, you're not the only one. With Jay Garrick apparently dead following the events of "Escape From Earth-2" last week and the breaches between Earth-1 and Earth-2 closed for good, Team Flash faced off against King Shark, with John Diggle and Lyla Michaels from Arrow at their side. ...the face of Jay Garrick? While there's still going to be plenty of speculation as to just who the Man in the Iron Mask is (my odds are still on "the real Jay Garrick"), Zoom's identity was seemingly narrowed to just two possibilities, then: Jay Garrick (somehow), or his Earth-1 doppelganger, Hunter Zolomon. In the comics, of course, a man by the name of Hunter Zolomon became Zoom -- a villain who can mimic super-speed by essentially moving between seconds. And so when Jay Garrick revealed to Caitlin Snow a few weeks back that his Earth-1 doppelganger was in fact named Zolomon and not Garrick (he was adopted here), fans erupted into speculation that he would turn out to be Zoom. 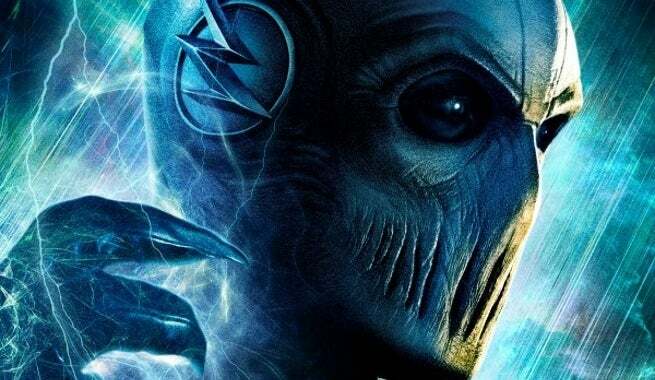 Paired with early theories that Jay in fact was Zoom, there's been a lot of talk for a while now -- and it was only exacerbated by Jay's apparent death last week. So, what's the verdict? While it hasn't happened on TV yet, executive producer Andrew Kreisberg told EW that the man we saw unmask tonight is in fact Hunter Zolomon. They go on, however, to talk about how he managed to betray the group, implying that Zoom is the one who's been walking among them all along. So...is it possible that the Man in the Iron Mask is the real Jay Garrick and that both versions of Teddy Sears's character have been Zolomon all along? Is it the Earth-1 version who died? Or the Earth-1 version who killed his Earth-2 doppelganger? Maybe something else entirely? We'll find out on March 22, when the series returns from hiatus. The Flash airs on Tuesdays at 8 p.m. ET/PT on The CW.